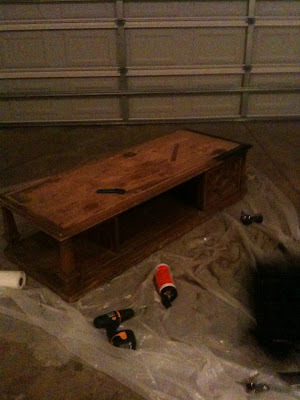 K Carberry: Weekend Thrifting, Table Re-do, etc.. I haven't had time to post about my excellent finds this weekend, but expect to see photos soon! First, I discovered that the town that is only 7 miles from me is nothing but antique stores. I have no idea why it took me two years of living here to discover this! Actually, I do...this town literally consists of one street and I don't drive in that direction often. When I do, I drive right by and think nothing of it. They have a fairly popular flea market, but it's not popular because it's a flea market...but because it has concerts a lot with people who were famous 20 and 30 years ago. The concerts are vintage like the merchandise. However, the concerts are not as expensive as the merchandise. I did find a few things that I would like, but I thought they were overpriced, with the exception of some dishes...but I've bought too many dishes lately, so I put those on hold. The only reason I went to the flea market this weekend is because I slept in too late to go to any yard sales. After I was a little let down at the flea market, I decided to ride around to see if I could find any yard sales still happening. Well, I didn't see any in this particular town, but noticed as I was driving past that there was an antiques store. I knew I had to come by there on the way home so I kept driving to the next town (only ten minutes away). I saw a sign for a thrift store that I didn't know was around, so I went and visited. Sadly, they are about to close up shop due to the lack of donations, but I found a set of custom made valances with the bed skirt...$20 for the set. It's very nice decorators fabric. I didn't need the entire set, but thought the long valance might look nice in my breakfast nook. I got it for $5. I stopped in at the "antiques store" on the way back and was completely shocked that the entire street was nothing but antiques stores! WHAT?! I went to every one. I was mainly just browsing, but I found one store that had a lot of small things like, oh vases and flatware for ONE PENNY! I will be posting photos soon, I promise! I'll see you all for Tablescape Thursday tomorrow, which is in my breakfast room, so I'll be showcasing the new draperies! NOTE: Ok, so I didn't make Tablescape Thursday. The table re-do sucked me in and between that and work, no time to put the finishing touches on the tablescape. I'll be here next week though! Ok, so that's semi before. I had already taken off one door and sanded a good bit of the top. It was worse, if you can imagine. What do you think?? I should note that this is not for my living room, but for my guest bedroom, which is done in all black and white with a little bit of French flair. It's turning out really cute, I love it that you chose black. I need a coffee table baaaad, I'll have to go thrifting this weekend. I really like how that is turning out. How are you doing the diamond pattern? I have a stencil I used on a suitcase I painted. It looks like you might be using tape. I can't wait to see it finished. Hi Tracy, thanks for your comment. I was going to buy a stencil but the cheapest I could find was $17 at Hobby Lobby and I decided I could wing it instead of using that! I determined what size diamond would repeat pretty evenly across the table. After that, I created a diamond shape using good ol' MS Word and printed it out in red. I then took the paper and taped it to a piece of posterboard, then cut out the diamond shape using a straight edged razor. I tried doing this with two at a time, but there were smears at the points. So, it's slow going with one at a time, but that's what I am doing! The ones that are closest to the design in the center, I am freehanding and using a ruler to be sure they are straight. I used a plate as my circle shape. Thanks for coming by my blog, Kristy. I'm glad you did b/c now I get to keep up with you. This table is fabulous! Good grief that looks like ALOT of work - it'll be worth it and you're getting a good workout. I'm in NW Georgia (Cartersville). Do you ever go to Scott's Antique Market? I missed this month but it's AWESOME! Can't wait to see the finished table & I feel for you! 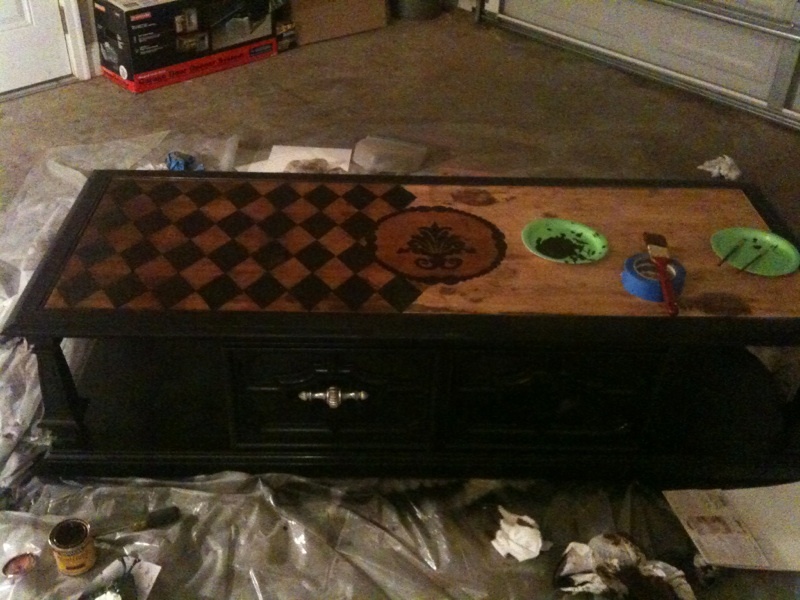 Your table looks awesome so far, I love the harlequin pattern! Keep up the good work. That's going to look great! Are you staining the design on top or painting it? It looks like stain to me, but then your little bowl looks like it probably has paint in it.